Timothy Taylor earned a CBC Bookie Award for his latest novel, The Blue Light Project. This March, I join my fellow citizens in the never-festive season of taxes—but what most people find familiar is actually quite novel to me. Since I quit my last real day job at the Toronto-Dominion Bank in 1991, you see, I have been an independent corporation. I have paid taxes, just not much on my personal income. That changed when I took a faculty position at the University of British Columbia last summer. For the first time in nearly twenty-five years, I started receiving an actual paycheque with deductions. March now has a weightier feel. Weirdly, I relish it. Maybe it’s just because Canadian politicians, whom I find myself despising almost universally at this moment, all tell me that I should resist paying taxes. If Harper says, more or less, “No tax is a good tax,” and Trudeau and Mulcair have both ruled out tax increases for the middle class—as in ever—well, there must be something good about them. That contrarian logic may lack robustness, but such is the state of our politics today. Virtually nobody campaigns on tax policy beyond saying taxes are bad. Here I find myself in agreement with a thoughtful new book of essays edited by Canadian civil servant and academic Alex Himelfarb and his son Jordan. Tax Is Not a Four-Letter Word attempts what could be among the hardest of hard sells: convincing people that they should be prepared to at least discuss taxes in the service of fairness, preservation of social programs, and ongoing economic health. I might as well come clean here, at the top. From the standpoint of the conventional left-right spectrum (arguably defunct, more on that later), I’m not always on the same page as the Canadian Centre for Policy Alternatives, several of whose leading lights have contributed to the Himelfarbs’ book. At the risk of over-disclosure, my high school yearbook recorded my then pet peeves as “poodles, math, and socialists,” each of which I regret naming, though for different reasons and in varying degrees. However, I’m happy to concur with the CCPA in principle on this issue: we need taxation to become part of the agenda. My agreement with those experts, which defies the very idea of a political spectrum, draws attention to a critical point. Taxes represent more than just a political and economic discussion; they form part of a larger cultural one. Cut Taxes Not Defense,” read a sign that Alex Himelfarb once saw in the background of a Tea Party demonstration. Change “defense” to “education” or “health care,” or “snowplowing,” and you can Canadianize the sentiment and highlight the paradox in play: people have decoupled taxes from the services they receive. They no longer view taxes as payment but as punishment. It was not always this way, as UBC economist and tax expert Kevin Milligan points out; a complete sea change has occurred over thirty-odd years in how taxes are perceived by the public and used by government. Himelfarb argues that it all began with economic neo-liberalism, as popularized by the Thatcher and Reagan administrations and later by Brian Mulroney in Canada—the principles we now all know: smaller government, lower taxes. I can testify to their seductive power, because I was studying economics at the University of Alberta during those very years. I have a distinct memory of the Laffer Curve first being trotted out for a political purpose. In a press photo, Stanford-trained economist Arthur Laffer stands with President Reagan in front of a blackboard with x and y axes plotting tax rates against revenue, the graph illustrating that tax increases only generate higher revenues up to a certain threshold, after which the relationship inverts. Laffer did not put forward one magic, optimal tax rate. He suggested a theory, uncontroversial really, in which the taxable citizens, companies, and transactions in our economy resemble anything else in life on which we place demands—our knees, our spouses’ patience—in that increasing demand only raises returns up to a point, after which further increases result in your getting a lot less. This was not implicitly an idea of the right, it should be noted. Laffer said he got it from the legendary British economist John Maynard Keynes, who is typically associated with the left, but this just shows that neutral concepts can be weaponized in politics. Reagan used Laffer to justify generalized tax cutting, part of the neo-liberal economic agenda to minimize government in favour of the market, and the concept hit what can be seen in retrospect as a political sweet spot. Margaret Thatcher won in 1983, pulling away with a 73 percent voter turnout. Ronald Reagan won in 1984 with one of the highest popular votes in American history. Meanwhile, in Canada that same year, Mulroney was elected with over half of the popular vote and no other party reaching fifty seats. Neo-liberalism eased smoothly into the discourse because people welcomed it there. Western economies were in stagflation, and Canadian taxpayers were paying a quarter of every tax dollar toward interest on the national debt. In positing the antidote, which Himelfarb himself refers to as a “counter-revolution,” neo-liberal economics overturned an understanding of the relationship between citizens and their countries that had existed since World War II. We defined an optimistic, progressive Canada during those postwar years, in other words, and Himelfarb would have us believe that with the dawn of neo-liberal economics we began to dismantle it. Part of me wants to dispute the charge. As a young economics student—during a time, let’s say, when I hoped economics might explain everything—I was persuaded by the elegant simplicity and individualistic ethics of neo-liberal ideas. Yet I cannot deny the negative aspects of our situation today that derive from the three-decade project to get government out of our lives and rely as exclusively as possible on markets. Chief among these would be an endemic distrust and cynicism about political engagement. Admittedly, it is impossible to prove that big government, 1970s-style, would have avoided this outcome (even if we could have afforded it), but neo-liberal economics has proven to be an undertaking that eats itself on the occasion of its triumph. Tell people that government is evil for long enough, that it is wasteful and inefficient and obstructs our freedoms, and eventually they will believe you so thoroughly that it will impinge on the ability of you or anybody else to govern. The economic legacies are perhaps even bigger concerns. While we are aggregately richer, the data is clear on the distribution of this greater wealth: real median incomes hover at around 1980 levels in Canada, and though low-income earners are probably no worse off than they were thirty years ago, the distance between them and the wealthy has grown vastly. Does income inequality matter? Well, for a long time conventional wisdom said it didn’t; pursuing income equality via redistribution was thought to reduce overall economic efficiency. Still, it is notable that the International Monetary Fund disagreed recently, writing in a 2011 report that “equality appears to be an important ingredient in promoting and sustaining growth.” As well, the research clearly shows that income inequality, to the extent that it contributes to poverty, has negative consequences on children and their futures. In the end, intuition can probably guide us here. Sure, income inequality can serve as a motivator. It proves on one level that people can get rich under the right circumstances, and data does support the point that more poor people manage to become rich now than in, say, the eighteenth century. Eventually, though, income inequality contributes to a sense of futility, which neo-liberal economic thinking tends to exacerbate with its hard stance on how government and its redistributive efforts are a waste of time. Here is where middle-income earners could contribute to the discourse, being neither fatalistically poor nor obliviously rich. Unfortunately, they are discouraged from doing so by the politics of our day, and by their own economic stagnation, which predisposes voters to reward politicians who offer tax breaks. Consider, suggests Milligan, that in the last federal election the Conservatives won on a suite of “boutique tax cuts”—for seniors, for working families, and so on—none of which meant much economically to either the government or the people receiving them, but all of which earned the Conservatives crucial votes. “A triumph of targeted political marketing,” Milligan says. Of course, everybody knew what the transaction was all about, and faith in government for the common good fell still further from the dubious toward the ridiculous. And so we arrive at the contemporary paradox, a “social trap” in Himelfarb’s analysis. When pollsters call us, 72 percent of high-income earners will agree that, sure, we should probably pay more tax to narrow the income equality gap; 89 percent of us will agree that we should look at something like a millionaires’ tax; and 60 percent will answer yes over the phone to whether or not there should be a carbon tax. Nevertheless, on election day, in the privacy of that voting booth, we will all do the same thing we did last time: vote for the government we think will cost us the least. How telling is it that right after admitting to smoking crack, Toronto mayor Rob Ford pledged to get back to work “saving taxpayers’ money,” as if amid all of the chaos there could be no more ardent statement of his commitment to his constituency. It was neo-liberal economics in tragic, red-faced emblem: a tyrant denying his abuse and wagging his finger at the straw man of big government. Promising, promising, while the ground shakes and the house burns down around him. It is a pretty compelling formulation, yet one of Himelfarb’s own comments leads me to think that we require another dimension to describe the situation. Taxes were the hinge that connected us to a common purpose, he says, cutting to the heart of what they represent versus what they are, strictly speaking, collected to do. We pay taxes to build roads, to hire teachers and firefighters, to fund EI and income assistance. But we also pay to play, and the game in question is citizenship, membership, community. Surely nothing could highlight our vanishing willingness to meaningfully engage with one another in these ways than the experience of implementing the HST and carbon taxes in British Columbia, where Milligan says he encountered resistance, even among those who would receive full compensation. These were clearly not economic positions being staked; they were cultural statements about the willingness to contribute at all. Here is where, neo-liberal or Marxist or whatever we call ourselves, we should not be surprised. 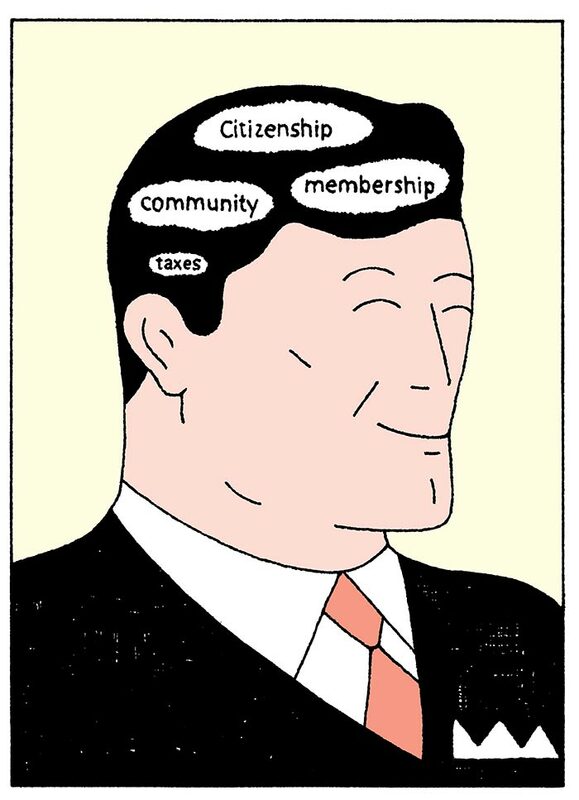 Citizenship, membership, and community are collective conceptions of the self, and our steady drift toward more individual self-conceptions has been underway for far longer than neo-liberal economics, and in ways that have nothing to do with the economy. Viewed through the widest lens, we are in the late stages of what philosopher Charles Taylor has called “the great disembedding,” a process whereby we increasingly define ourselves independently of formal obligation to any matrix or hierarchy. Perhaps the writer who speaks most emphatically to this dynamic is Alexis de Tocqueville. In his nineteenth-century book Democracy in America, he directly addresses how these impulses played out in the North American context. He observed Americans to have a belief in “indefinite perfectibility,” which arose from their sense of equality. However, he also observed that in a society where all are equal and autonomous and endowed with a belief in self-improvement, we inevitably become less and less able to see ourselves as part of a larger narrative, one that involves our fellow citizens, as well as ancestors and descendants. Tocqueville was not recommending a return to aristocracy, despite coming from Norman nobility himself. He recognized the potency of what was flourishing in America, with Canada not far behind as our links to the monarchy grew ever more symbolic: the will to seek individual freedom and attainment. What was alive in the souls of Americans and Canadians during that heady postwar run that Himelfarb understandably remembers with wistful fondness? A common purpose stimulated by the horrors of a recent war, yes, but also a surging, empowered individual, with newly acknowledged human rights and freedoms, and the seemingly boundless capacity for improving the world. Indefinite perfectibility. The 1960s and 1970s in particular, just before the neo-liberal counter-revolution, were a time of intense optimism and assertive individual flowering. Yet it would be a mistake not to connect the dots from the freed individual with inherent rights and value, to the me generation and onward, to such possibly perverted conclusions as “Greed is good,” or even the hyperbolic Thatcherism “There is no such thing as society.” The mistake is to ignore the Tocquevillian conundrum: that these impulses toward individual freedom and attainment also contain the seed of a selfishness that isolates and confines us, cutting us off from one another and from generations past and future. In the earliest years of the neo-liberal counter-revolution, that selfishness may have seemed like the necessary fuel to power us out of economic malaise. Perhaps at that moment in history, a set of economic ideas was allowed to hijack the boat on which social justice might have otherwise sailed, but the evolution was not simply a shift from left to right. The culture as a whole was on the move across social as well as economic dimensions. Around the time that the Laffer Curve was first dusted off for political use, an epic hyper-liberalizing of both the self and the economy was underway, both born of the same impulse for freedom. Maybe having a child has shaped me here in a way that my economics and business education could not have anticipated, linking me to something intergenerational, making concrete the idea of obligation, causing Tocqueville to resonate. Almost certainly, my time in the Canadian Forces had an effect, acquainting me (perhaps temporarily, but unforgettably) with how the civilian values of individual freedom and attainment both repudiate and yet paradoxically depend on the core military values of duty and sacrifice. You can’t have the former without the latter, as World War II proved to Alex Himelfarb’s generation. Therefore, it would seem like an easy bit of reductionism to now blame Wall Street for everything (or poodles, or socialists), and what is easy is rarely best. An urgency exists here, I would argue, as we face something like a Tragedy of the Commons 2.0. Just as, in the original version, cattle farmers were observed to over-graze a shared field while sustainably using their private plots, we are failing to sustain a resource over which we no longer feel any obligation, that part of ourselves that was once embedded in citizenship, membership, and community. What is common among us—the environment, the education of our kids, just treatment for all citizens, the very idea of being Canadian—finds itself starved of investment. The damage, meanwhile, is there to measure: income inequality, a stagnant middle class, mounting distrust of leadership, and a corrosive, cynical political machinery that now competes for votes in a manner that is only semantically different from buying them. We are good at individual rights and freedoms. We’re not so hot at duty and sacrifice. And that is not simply because of neo-liberal economics. It is because Tocqueville was right 100 years before Arthur Laffer was born. Trudeau and Robertson may question it, but we shouldn’t. Instead, we should urgently commit to thinking about how free, autonomous individuals can yet reconstruct the common good, such that citizens feel a genuine obligation to it, and that will entail putting taxes back on the agenda. We need to pay, but we also need to be ready to play. The good news is that this is already happening, in a scattered way. The Himelfarbs have released their book. Susan Holt of the New Brunswick Business Council has recently called for the province to increase HST and corporate income taxes to help reduce the deficit. Last September, Missouri governor Jay Nixon vetoed a piece of tax-cutting legislation in his state that he argued would harm schools and mental health services. In California, Proposition 30 passed last November, permitting new taxes to fund education. Meanwhile, over at the Patriotic Millionaires website, you can find 100-plus people earning over $1 million a year who join billionaire Warren Buffett in calling for President Barack Obama to increase taxes on the rich, including themselves. Which returns us to obligation. None of this works if we don’t figure out how to feel the debt that Alexis de Tocqueville predicted we would struggle to feel. “He willingly sets himself duties towards both [generations before and after]…and he frequently comes to sacrifice his personal pleasures to these beings who no longer exist or do not yet exist.” That’s Tocqueville on the citizen under aristocracy, something we might consider trying to duplicate using our necessarily more individualistic motivations. It may well seem like a stretch—a cultural change, an awakened sense of duty almost certainly reliant on a political leadership now non-existent—but then, nobody said this indefinite perfectibility business would be easy.